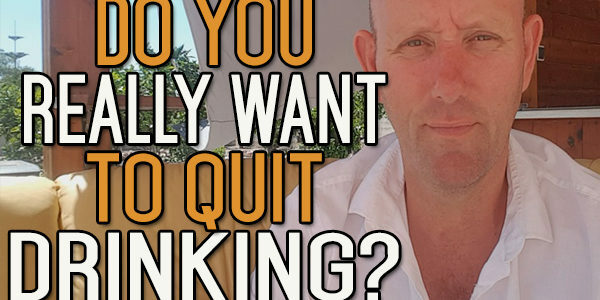 Today’s video is about the topic of needing or wanting to quit drinking. They can be two completely different perspectives. If you don’t want to quit drinking, you’re going to find it very difficult to do this in the long-term. There’s a big difference between wanting and needing to quit. Most of us get into quitting drinking because we have to stop, for one reason or another. We know we need to do this, but there is a reluctance to start and once we do start, a period of mourning for our loss. Sometimes this mourning period never ends. That’s why you have so many people still referring to themselves as alcoholics even decades after they have taken their last alcoholic drink. What can we do? Today, I want to talk about the topic of wanting to quit drinking. If you don’t want to quit drinking, you’re going to find it very difficult to do this in the long-term. There’s a big difference between wanting and needing to quit. Most of us get into quitting drinking because we need to quit. Someone or something in the background is forcing the decision on you. You’ve been drinking for a long time. Maybe there’s a person behind you that’s encouraging you to seek some help. There’s an environmental issue that you have to get over. I quit drinking a few years ago. When I first attempted to quit, I got a DUI and I had to quit because of that. Others will find different reasons. Maybe it’s health or whatever, but mostly when you need to quit, it’s a quitting in the moment. It’s a need to quit now. For instance, when I quit and got the DUI, I did stop drinking for almost a year. Towards the end of that year, I disappeared from all the reasons I had started to. 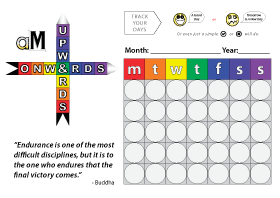 I was two months away from completing the year, and the reasons I quit had disappeared. It’s the same thing if you have someone in the background who is trying to encourage you to quit or if you have a health problem. Those are there in the moment, and they’re spurring you on to do what you need to do. But, give it a month down the road or two, and the person who has been behind you will see the positive change and might think you’ve managed to do that. You might think different things. The health issues might have disappeared. The life issues you had are probably going to have disappeared. In 2 or 3 months, you’re probably not going to have the same motivation as Day 1. So, you have to have a big want to quit, and you have to maintain that want. You have to have the want motivating you. The second time I quit, I wanted to quit for myself first and foremost, but I knew what I was doing in my life. I knew the pressure I was putting on my son subconsciously. I knew the type of influence I was giving him as a father, and that was killing me. Once I realised it, then it was a huge motivation and nothing was going to stop me from changing that. I was afraid for my own health, for myself. I knew alcohol was causing me not only to have health problems, but I had health problems also associated with many other areas of my life because you let so many areas go because you only have 24 hours in a day. 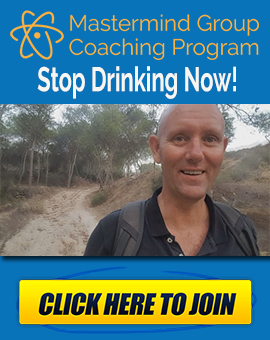 If you’re spending a huge chunk of that time thinking about drinking and overcoming the consequences of drinking, then everything else you have to do in your life has to be squeezed into an ever narrowing chunk of time. You stop looking after yourself. You stop exercising as much as you should. You might stop eating well altogether. This is where I was going. You stop caring for yourself, and then you stop caring for other people. It becomes that deep pit where you’re gradually sinking lower and lower. You can see how in those moments where everything comes together in a bombshell or a tiny thing…for me it was watching my son pacing up and down the beach looking for an iPod he’d lost in the sand. That was all it took for me. But it was the culmination of many thoughts, and a lot of inner debate over many years about my drinking lifestyle. 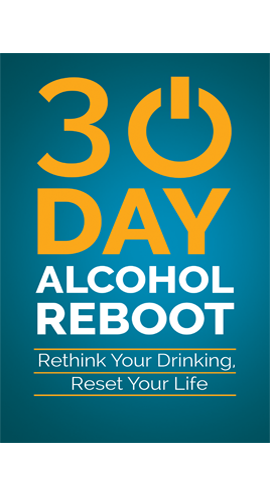 For some, it might be something huge, but you can imagine how if you have something that happens and it’s big enough to force you to stop drinking, how when that motivation disappears later, it’s going to be easier to think you can handle the alcohol now. You have to start with a big want. If you don’t start with that…I’m not saying you can’t start with the bombshell moment, that’s good too, but in the months that follow, you have to try and find your big reason why. You have to find that motivation to make you want to stop drinking. There are a lot of different ways you can do this. The first one is trying to look at your values. Look at your core values. What is it you want to do in your life? What do you stand for as a person? I wanted to be a good father, and that was my biggest motivation. I wanted to be a good partner to Esther. Education and growth was another one. All my life, I’ve always pursued education in one form or another, but the more you rely on a drug for something, the more the information is either not going in the first place, or when you do put it in, it’s going in one ear and out the other ear. The comprehension rates are not good, and it starts to suffer in the long term. So, you can find whatever it is that you value. That’s a good place to start looking for a big reason why. You can ask yourself simple things like ‘why am I doing this? For whom?’ and that might give you responses. You might be looking in the wrong direction. Your purpose might be completely wrong. In that case, do these exercises and try and find something. Try and look at your values and ask yourself simple questions. Spend a lot of time thinking about this because you have about two or three months to do this before the initial wave of enthusiasm wears off and you start thinking about booze again. A lot of the times, it’s because we get so stuck in the moment and we can’t see the future, so one of the methods I talk about a lot is the Dickens technique. Imagine 3 ghosts coming to visit you one night. One’s taking you to the past, one is showing you your present time, and another one is taking you to a couple of different possible futures. One possible futures is when you don’t quit, and the other one is when you do quit. You see the difference in that. Take yourself 5 or 10 years down the road and give yourself a bit of time to think things through. See where the consequences lie. Try and find that big reason why you’re doing anything in life. Needing to do something is one thing, but it’s one thing to do it; and having the motivation to carry on doing it into the long term is a different thing. Try and find your big, compelling reason why you’re doing this. You can find that in different areas of your life. Most of it will be found inside your head because it’s your connection to people around you, to your environment. It’s what drives your emotions. That’s where you have to look. 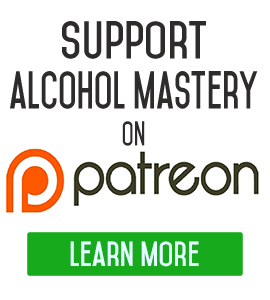 If you need any help at all with quitting drinking, we have the Alcohol Mastery starter pack which is over on the website. Just leave your name and email address and there are a couple of different courses and eBooks. If you have any questions, leave them down below. Until next time, keep the alcohol out of your mouth. Don’t stop. Push harder. Keep going. What do you do if someone doesn’t have the desire to quit?